HACCP is a food safety management system which if correctly designed and fully implemented will guarantee, as far as is reasonably possible, the safety of your food. MyHACCP will guide you through the process of designing an appropriate HACCP for your business but this will only be effective if you take sufficient care to ensure that the preparatory stages have been completed. The purpose of completing the 8 preparatory stages prior to applying the HACCP principles is to ensure that the basic hygiene controls are in place within your business and that you fully understand your products and their intended use before you start to manage the specific hazards associated with your foods. Each of these stages is important to ensure that your final HACCP is effective, and you are advised to carefully consider the answers that you give to the questions raised by MyHACCP. 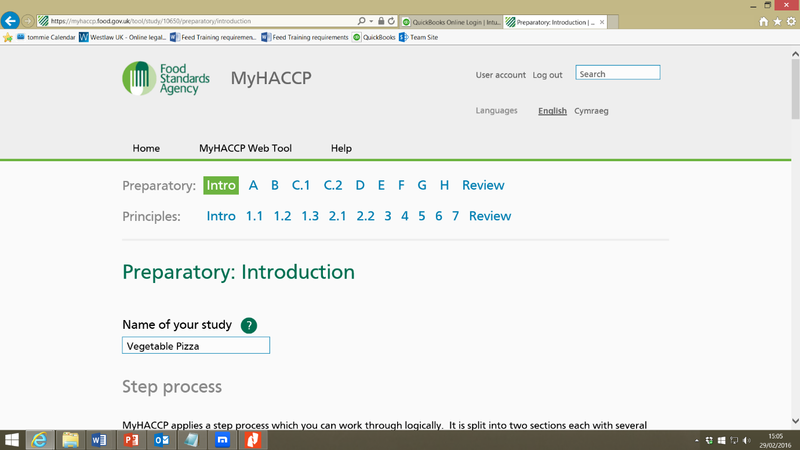 Once you begin a study using the MyHACCP tool you will be invited to complete the preparatory stages A-H. Whilst it may be tempting to gloss over these, you may find that time invested in thoroughly completing this section will reap benefits later in the process. For example, a detailed understanding of your product and the way that your customers are likely to consume it will assist in the accurate identification and control of food safety hazards later in the study. The screenshot below shows the preparatory stages A – H and the “Review” stage and each of these are explained in the links below. Please use the sub-navigation to navigate between the help topics for the Preparatory Stages of the Web Tool.